Really fun to play deck based on reflection and a little bit of random. 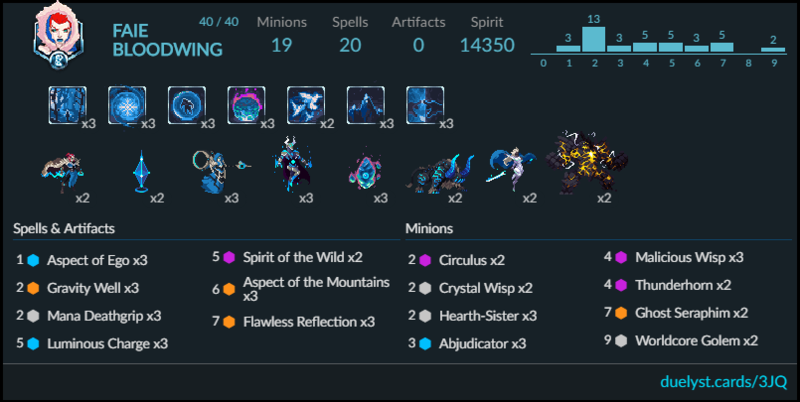 A really fun-to-play deck based on Reflection and a little bit of randomness. Let’s make Vanar great again! 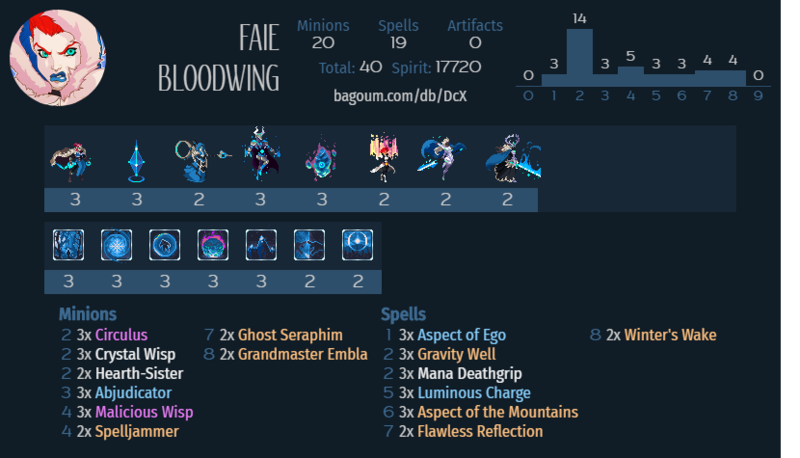 As some of you will remember, Flawless Reflection+Seraphim was a ridiculously overpowered combo a few patches ago, and it also was one of my favorite decks, so I just tried to make it work again. The main idea of the deck is simple – at the beginning you try to gain as many mana crystals as possible and in the middle game you try to make enough walls that Reflecting them into something powerful gives you lethal. Circulus is mostly for maintaining your hand size, but try to keep at least 1 Illusion to use with Aspect of the Mountains. Likewise, try to keep Gravity Well and Aspect of the Mountains in hand to use them together. Malicious Wisp: Permanent +1 mana for you and -1 mana for them (since Wisp transforming stops the mana crystal from being returned) is huge, especially against Wanderer and Vetruvian. It also helps you handle EMPs and it is possible to get really nice things from it – you can even get instant Build minions (Gate of the Undervault, Gigaloth, etc). Embla: At the same time, you get both a large amount of walls and a powerful minion to Reflect them into. Enemy minions: The worst way to play the card, but since the deck doesn’t have any dispel it is also almost the only way to debuff enemies or deal with resummon-on-death abilities. All eggs cost 0 mana, so they always transform into Rae (battle pet), and Luminous Charge walls can be used there for clearing or 2 damage lethals. Your walls: To reposition them for Reflection or Aspect of the Mountains – this is also a bad use for the card because of 1-mana battle pets. Reflection interactions: Trial-buffed minions: When you use reflection on them, Reflected minions will keep their Trial buffs (Wanderer’s +1/+1, Xor’Xuul’s resummon-on-death, etc). Intensify: Each Reflected minion counts toward Intensify, so if you Reflect something like Bonecrusher or Okkadok some copies will get a boosted Intensify bonus. This also works with Coalfist’s attack buff. Abjudicator/Seraphim: Abjudicators are really useful for making Flawless Reflection cost 6 (ideally 5), making it then cost 1 mana (or 0) with Seraphim. General: Kara is a good option – your walls will be tougher and won’t die to 1 damage AoE (Skorn, Ghost Lightning, etc). Kron/White Widow/Thunderhorn/Jax Truesight/Mnemovore/Ice Age/Owlbeast: All of those suit this deck well. Swap Spelljammers in if you want to. another option: play World Core Golem and transform/reflect it into few grandmasters kraigons (only kraigon is the other 9 mana card) on next turn (or just use heart-sister for finish). With abjudicators it is also possible to ego+walls+reflection on one turn. This variations works surprisingly very well even without kraigon combo. How does aspect of ego on malicious wisp help vs emp? Emp cost 7 mana, wisps+ego cost 4-5 mana, so basically it grants you a safe turn. And with some luck it is even possible prevent your opponent from getting 7 mana till the end of the game. A warning: As far as I know, Aspect of Ego on an egg has an equal chance of hitting the other 0-mana nontoken minion, Hideatsu the Ebon Ox. (I haven’t tested this with Aspect directly, but I remember it working this way for the Andromeda boss fight). Vespyers and Walls mix together very nicely when supported by Kara. Add tons of ramp, and you have a very scary versatile deck that, unlike dedicated walls, wont just fold to an EMP. A very control-oriented deck featuring Kraigon, Red Synja, and Keeper of the Vale. A variant of Winter’s Wake that attempts to make the combo more consistent using Q’orrhlma’A.